The New York Times published a very nice obituary by Margalit Fox. The Barstow family has posted video of Robbin’s memorial service, held at the at First Church of Christ in Wethersfield, Connecticut, on November 13, 2010. The Hartford Courant has posted a bio of Robbins in their “Extraordinary Life” column. Robbins Barstow’s family has written to say that Robbins died at his home in Wethersfield, Connecticut on Sunday, two weeks after his 91st birthday. Robbins joined the Amateur Cinema League in the 1930s and made one of his most famous films (and one of the very first fan films), Tarzan and the Rocky Gorge in 1936. His other masterpiece, 1956’s Disneyland Dream, about winning a trip with his family to the newly-opened Disneyland park, was named to the National Film Registry in 2008. One of the most unique things about Robbins was the way in which he kept his films alive for decades after their creation. 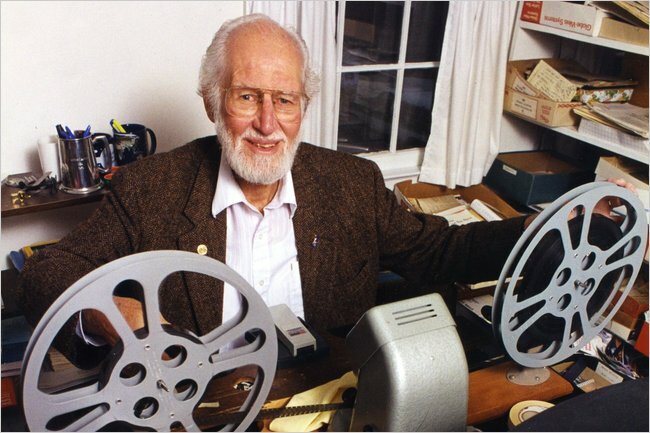 He edited his 16mm films then transferred them to video at the Wethersfield public access TV station (which he helped to create), adding his own narration. He distributed his films first on VHS, then DVD, and then finally on the Internet Archive. After learning about Archive.org he leaped into digital realm with both feet, and uploaded nearly all of “Barstow Travel Adventure” films. He then eagerly watched as their popularity took off among the younger generations. Disneyland Dream and Tarzan and the Rocky Gorge both went viral, and currently have 76,000 and 151,000 downloads respectively. Last year he also began selling Disneyland Dream through Amazon’s DVD-R program. Although the film world got to know Robbins through his movies, he also worked as the director of professional development for the Connecticut Educational Association. He was also a founder of the Cetacean Society International, and many of his Barstow Travel Adventures as well as the 1970s sequel to Tarzan and the Rocky Gorge focused on his love for the great whales.